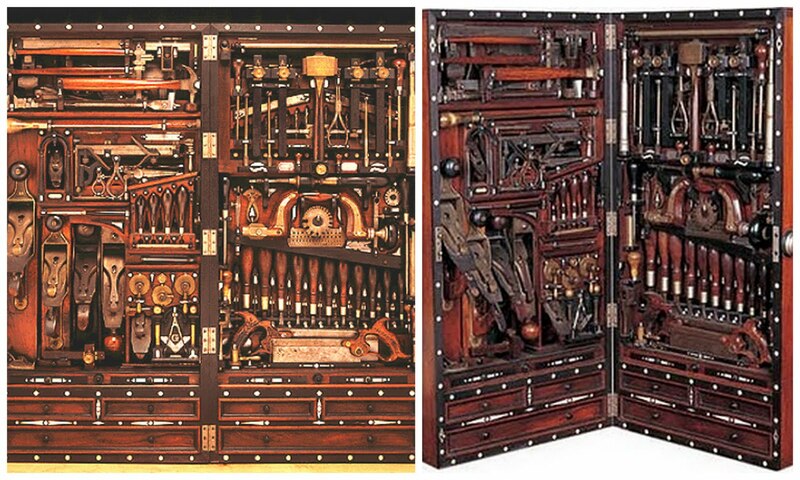 Exquisite Example of 19th-century tool-chest craftsmanship. Massachusetts piano maker, Henry Studley built his magnificent tool chest over the course of a 30-year career at the Poole Piano Company. The chest lived on the wall near his work bench, and he worked on it regularly, making changes and adding new tools as he acquired them. It holds some 300 tools, so densely packed that three strong men strain to lift it. It is just 9" deep, 39" high, and about 19" wide. Studley was well into his 80's before he retired from the piano company. Before he died in 1925, Studley gave the tool chest to a friend. That man's grandson, Peter Hardwick, loaned the chest to the Smithsonian in the late 1980's and later sold it to a private collector in the Midwest. I found this information in a great book, "Treasure Chests"